When choosing Precision Clarvista Glass for your bathroom makeover, you are choosing a product that will seamlessly blend in to your existing décor. Clarvista products are known to enhance the beauty of bathroom cabinetry, allow tile or stone work to shine, and reflect any natural sunlight for optimal brightness. While Clarvista glass is available in a variety of glass options, contact Precision Shower Doors for assistance on a Clarvista option guaranteed to produce maximum brightness and clarity. Glass is made up of a porous material that is susceptible to corrosion from repeated exposure to heat, humidity, and harsh cleaning products. 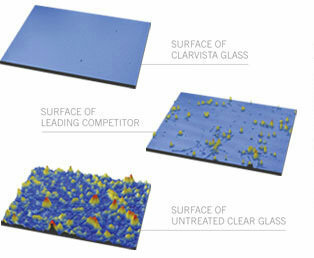 All Clarvista glass is produced with a coating, fused to the glass, and sealing the glass substrates to provide a protective seal.